BSJK's portfolio consists of bonds that mature throughout 2020; hence, its effective duration is approximately one year. Its risk/reward profile is attractive relative to other fixed income portfolios, as duration is low yet it yields ~4%. Unanticipated defaults are the primary risk associated with this strategy, though the market currently prices its underlying securities with minimal default risk. As shown in the chart above, BSJK’s top 10 holdings equate to roughly 34% of the total portfolio and its top 20 holdings equate to roughly 54%. 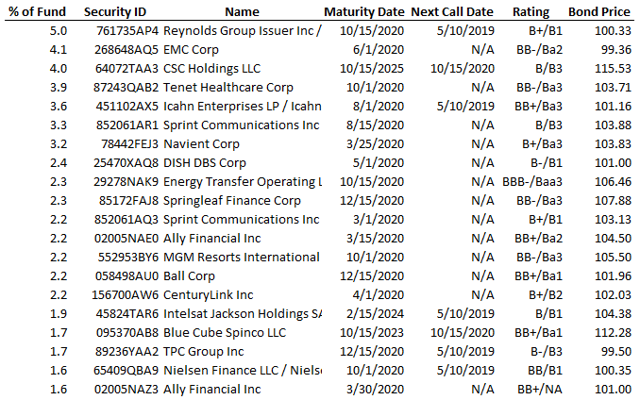 For a bond portfolio that matures in just over one year, this seems reasonably diversified. 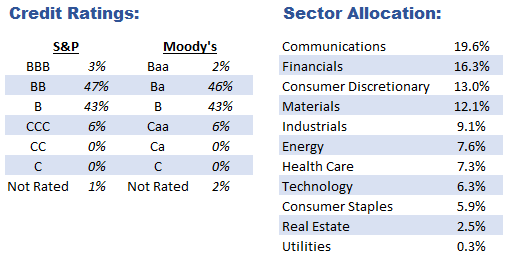 In addition, none of the top 20 holdings are rated below B- by S&P nor below B3 by Moody’s. Therefore, most holdings are considered speculative but are not considered extremely risky, nor are there any bonds that are in default. The chart above lists the bottom 20 holdings based on market price. 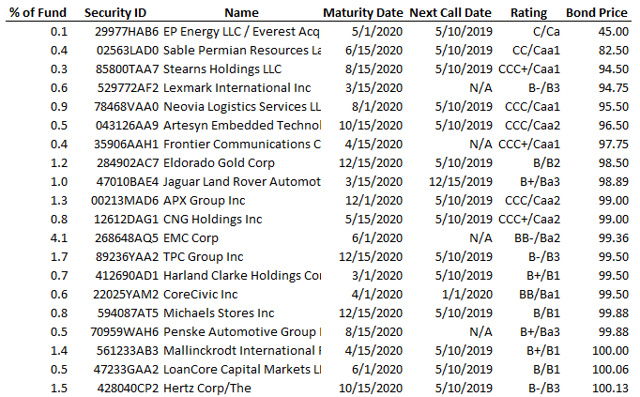 There is one bond (EP Energy LLC – 29977HAB6) that is priced with significant default risk, though it only occupies 0.1% of the total portfolio. Should this bond default (and be priced at $0), investors will experience a corresponding negative 0.1% return accordingly – nothing to be too concerned about. In fact, there are only four bonds that are priced below $95 (for a total of 1.4% of the overall portfolio), which is an appropriate benchmark when determining potential default risk, based on bonds maturing in one year and assuming par values of $100. Therefore, credit risk seems minimal with BSJK based on the market prices of the underlying bonds. Projecting BSJK’s past performance as an indication of potential future performance is basically worthless. The fund was incepted almost six years ago, which means its credit and duration risks were substantially higher, as it was significantly more sensitive to interest rate movements and credit spreads. However, since the effective duration of the fund is now roughly one year, any sensitives toward broad fixed income risks will be limited. The best illustration of this theory is by analyzing BSJJ (Invesco’s 2019 High Yield fund) and BSJI (Invesco’s 2018 High Yield fund, which has matured and dissolved). As shown above, BSJI was less volatile than BSJJ and BSJK since it matured before those two funds. The same can be said about BSJJ vs. BSJK. For example, during the significant widening in credit spreads during Q4 of 2018, investors in BSJJ experienced a total return of -1.4% while investors in BSJK experienced a total return of -2.2%. Even though the credit profiles of both portfolios are relatively similar, BSJK’s performance was worse because its duration is higher (which infers a greater probability of default). Since past performance is not indicative of future performance, the most appropriate measure is to refer to BSJK’s yield to maturity (YTM) and yield to Worst (YTW) for the entire portfolio. These metrics indicate that the underlying bonds should provide an annualized yield of ~4% between now and the end of 2020, assuming no material changes to the portfolio and assuming default risk remains constant. For reference, the iShares iBoxx HY ETF’s (ticker: HYG) distribution yield is 5.2% and the SPDR High Yield ETF’s (ticker: JNK) distribution yield is 5.6%. 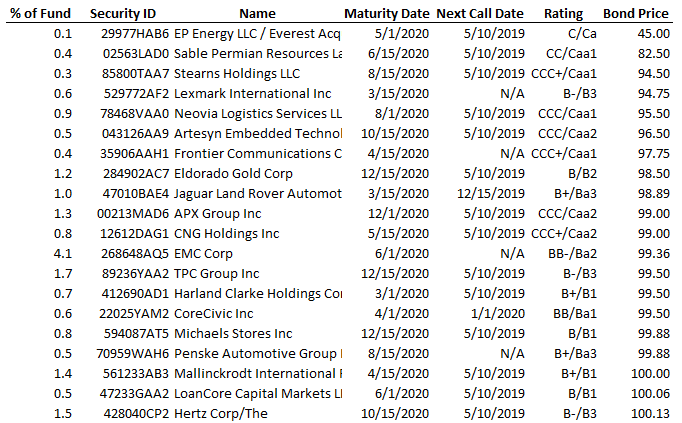 These two ETFs are very popular among high yield investors, as their respective distribution rates are quite enticing. However, duration risk and price volatility (based on credit spreads) are also materially higher than BSJK; the effective durations for both funds are approximately 3.5 years. Therefore, BSJK’s distribution yield moving forward should be slightly less than either of these two funds, but its risk should be materially less. Furthermore, most investment grade, short duration funds pay less than a 3% distribution yield (especially considering that one-year U.S. Treasuries currently yield 2.4%). Therefore, BSJK provides the opportunity for greater returns than its short-duration peers. The primary risk associated with BSJK stems from unforeseen defaults from any of the bonds within the portfolio. As previously discussed, only one bond (that accounts for 0.1% of the total portfolio) is priced to default. However, there is always potential for other bonds to start depreciating in value, should the fundamentals of the underlying company deteriorate. Therefore, the expected total return of BSJK will be lower should there be any unanticipated defaults (or potential defaults) with any of the underlying securities. Even though BSJK’s duration is low, it will still be impacted by credit spreads – though in a relatively limited fashion. If credit spreads widen, then BSJK’s price / NAV (based on the price of the individual bonds) will detract accordingly. However, assuming no additional defaults are expected, this price volatility would be short-term in nature, as BSJK’s NAV should revert back to the corresponding par values of the underlying bonds as they near their respective maturity dates. The goal of this thesis is to highlight a fixed income solution that provides an enticing risk/reward profile. It provides greater distribution yields than most short duration funds, yet duration risk is minimal and credit risk seems manageable. Its expected distribution yield is less than other high yield bond funds, but portfolio risks are substantially lower. Therefore, as investors navigate a low interest-rate environment with tight credit spreads, BSJK provides an attractive opportunity within the fixed income universe.